BALANCE COMES FROM WITHIN. STOP, LISTEN AND CARE. Join us for listening and experiencing present moment glimpses! Mainly in a doing mode, always pursuing for faster or better, often chasing to catching our breath at the intersection between work and private commitments. Know someone?! We are constantly ON – on continuous connectivity, on multitasking demands, email or instant messaging. As a result, we find difficulty in SWITCHING OFF the doing. This constant external focus has impact on our well-being, concentration ability, relationships and work. 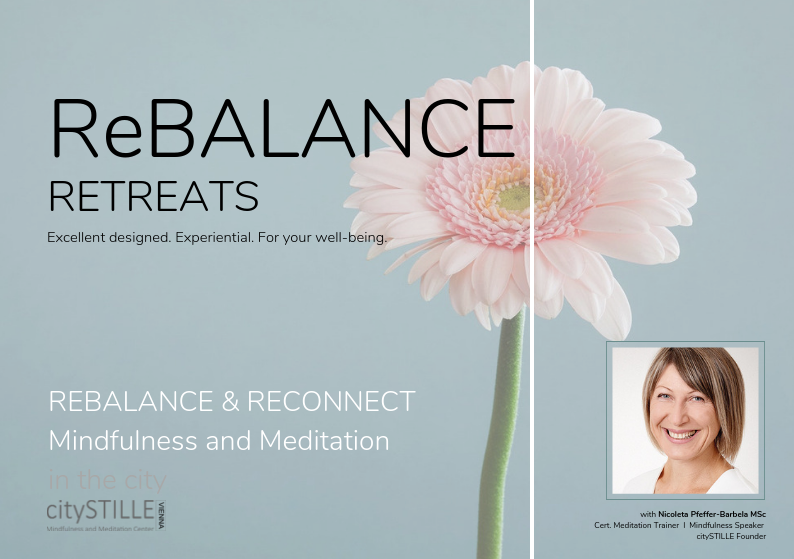 Our ReBALANCE Retreats aim to provide you with an opportunity to step beyond the daily routines, to-do lists or automatic behaviour and experience an encounter with the fragile & strong, harsh & compassionate YOU in front of the screen of thoughts and feelings passing by. You will find out by the end of the day that we are all experiencing the same kind of perceptions and, we all share a deep desire: to be happy and well! citySTILLE – this unique city oasis of stillness easies the process of tapping into your peace, calm, love and equanimity oasis within. We are offering a great combination of indoor and outdoors mindfulness practice due to the great locations we cooperate with, in the country. For a deep sense of re-treat and re-balance! See below some timeframes or let us know your own preference. Guidance: Nicoleta Pfeffer-Barbela, Cert. Meditation Trainer & Speaker, Founder of citySTILLE (BIO) . For retreats longer then one day, experienced yoga trainer, music therapists and nutritionists can join your nourishing experience! Let’s talk! For your best experience, a retreat will take place with minimum 7 participants. Check program sample for more info.